I am a creature of habit. Some good, some bad. I really don’t want to be this kind of person. I like to think of myself as a rebel against such monotony. Yet, my habit forming nature takes over and I often end up back-peddling. Every June I rebel against cooking, cleaning, and all things domestic. The warm weather makes me want to spend every waking and sleeping moment outside. That means I don’t cook either, and we mainly eat out. This might normally be acceptable; except this is the only time of year we get local fresh fruits and vegetables. And every year, right smack in the middle of July I have a “new” epiphany. I miss cooking! Then the next Saturday I hit the farmers market, and am thrilled (overexcited) to see everything in full swing. I also start kicking myself for not coming earlier and for missing a potential month of fresh local food. In reaction, I way over buy. I load the husband, the kid, and myself down with bags of fruit and vegetables. We drag our bounty home with Jesse trying to act happy behind me. I’m sure he was wondering how we were going to fit everything into our overflowing refrigerator. I knew how though. I had been shoving things deeper into the back until I could no longer get even the smallest jar of jam in. I swear I’m turning into my mother. I began to clean, and it took a long time as almost everything was expired or moldy. Dare I tell you I found a strawberry rotting on the back shelf? A single lonely strawberry. I feel so ashamed. Although, the great soy sauce spill of 2009 was caused by Dishboy Scott, not me. Ahh I feel a bit better passing some of the blame. I guess I’m a creature of habit, albeit long cycle habits. I’m on the good habit cycle right now and this pasta is proof! 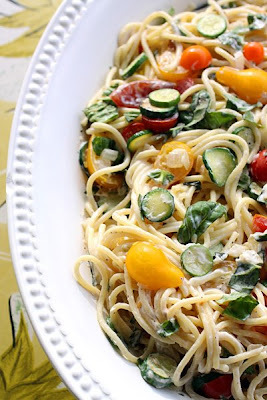 Warm, tangy, garlicky, creamy, beautiful, sweet from the fresh vegetables, and with just enough spaghetti you can’t call it a salad. This is a new favorite of mine and Jesse adores it too. Why didn’t I want to cook? I forget now. 1. Boil the spaghetti according to package directions adding 1-2 Tablespoons salt to the water. Set aside 1 cup of the salted pasta water at the end of cooking time. Place the spaghetti in a large bowl. 2. Warm the olive oil in a skillet over medium high heat, add the diced onion & season with salt & pepper. Cook for a couple minutes until the onions start to soften a bit. Add the baby zucchini and cook for 2 more minutes, add the minced garlic & cook for 30 seconds to 1 minute until fragrant. Add the mixture to the spaghetti. 3. Add the tomatoes, basil, crumbled goat cheese, pasta water & freshly cracked pepper to the spaghetti & toss to combine. Wait about 5 minutes for the sauce to thicken a bit and serve. My eyes are SO MUCH bigger than our stomachs when it comes to the farmer's market. I can't tell you how many times I've come home with WAY MORE food than two people could possibly eat in one week. On the up-side, the food is so fresh, it keeps longer! Honestly -- one of my favorite easy pasta sauces is goat cheese melted over noodles. Your version of the dish is positively mouth-watering! Another gorgeous and tasty dish. I suspect that most folks who love to cook share your love of farmer's markets. This looks absolutely gorgeous, and I am in complete agreement with you about the Farmer's Market overbuying/overstuffed fridge thing. I've found lonely rotting veggies in mine before, and it was the saddest thing in the world to see a wilting baby bok choi. Something maternal in me wanted to cry. Did you get your fresh garlic from the Hermitage stand? They had AWESOME Chinese chives this week, and I picked up almost everything they had to offer! Oh my Laura, this just looks awesome! I quickly printed this and am ready to fix this for our noon meal tomorrow. Re: the farmer's market, the fridge clean out and restocking along with the gooo spilt in the back from who knows when, yea,,, I thought you were literally describing my fridge. I almost felt like taking a pic and sending to you just to prove you are JUST LIKE ME or visa versa. Thanks again for wrapping your wonderful cooking skills around the zucchini dilema. Now I feel I have a few new tricks up my sleeve. Thanks for the visit!! Wow! you not cooking in June? I can't believe it, I think that your kitchen is your main room in the house, with all these good recipes I feel like you sleep right there, next to the refrigerator with your camara right next to you. I love the colors of this pasta. I love goat cheese. For sure this is a easy recipe I have to try.I am so glad you are having a great summer. Oh..I guess my refrigerator is calling me...time to clean too. This looks wonderful. I love pasta that highlights fresh vegetables! This is really close to a supper I make, from Rachael Ray's magazine. My fiance and step daughter LOVE it. Like, LOVE LOVE. I have a thing about recipes, about color, about presentation and I love this pasta, vegetables, combination. Looks really healthy. Keep bringing more. oh, I love goat cheese! I love the idea of using it as a pasta sauce with all of those veggies. Looks great. Oh, the ever powerful farmer's market...I feel exacty the same way. Inspired by nature's bounty. I'm not sure which stand Hermitage was, but I always hit my favorite one first. It's run by two women and their stuff is amazing! I pay a little more, but so worth it. I even bought a dozen amazing eggs from them. This pasta dish looks divine. I love goat cheese in pasta, just gets so creemy and melta. I like to rebel against habit too... but really, we are creatures of habit, everything about humans is a monotonous repetition, just think about the most basic aspects: breathing, heart-beats, walking... all repetitions! YUM! This sounds like a delicious recipe and all those veggies... I work with Chavrie goat cheese and this would make for a great summer dish. Gorgeous photos, as well! Oh me oh my! Heavenly summer fare! This looks amazing. The tomatoes are so colorful. I bet the goat cheese went wonderfully! It's hard not to get carried away with the bounty, isn't it? Laura, You've captured the best of summer in a lovely dish! It's absolutely beautiful, and delicious, too, no doubt. Gorgeous! xo~m. Love the colour palette of your pasta. So appertising! How gorgeous is this pic and how yummy is this dish?!? AWESOME!!! Smashing Pasta Dish! I love the vibrant colors. I missed the Farmer's Market the last 2 weeks and I am so remorseful. I get that way. Sometimes I am able to catch the (mini) grower's market in Pullman but it is such a let down in comparison. Thank god they have one -- finally. Oh this looks so beyond delicious. 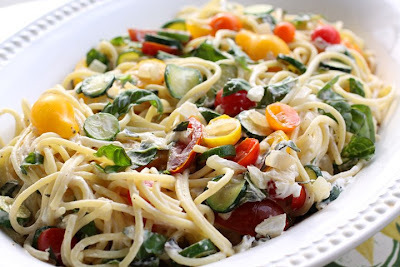 I love the use of the goat cheese and all those veggies, fabulous!! That looks sooo good... Also, your pictures are beautiful! Thank you for sharing your great recipe. I made it tonight for dinner and it was delicious! I already had all the ingredients on hand, so it was perfect. The only change I made was adding kalamata olives (only because I already had some in my fridge). Thanks again – this will definitely become one of my regulars! I am so happy to hear that! Thank-you for letting me know. Goat cheese and pasta are two of my favorite combinations. I love wandering around farmers' markets and always buy too much. That is half the fun! !